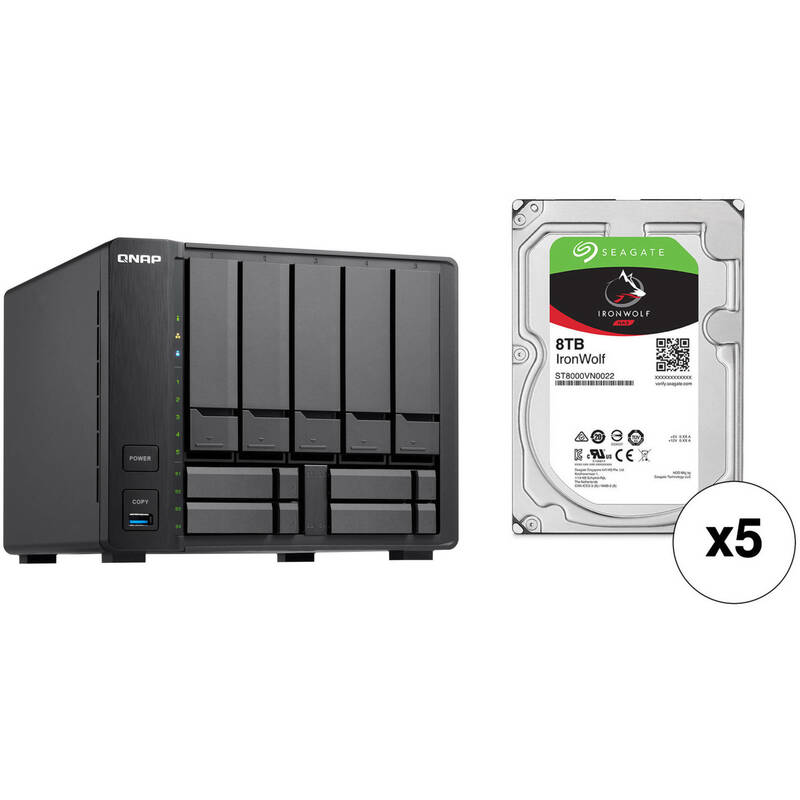 This B&H Kit combines the QNAP TVS-951X 9-Bay NAS Enclosure with five Seagate 8TB IronWolf 7200 rpm SATA III 3.5" Internal NAS HDDs for a total storage capacity of 40TB. Built as a high-performance and budget-friendly storage solution for SMBs, the TVS-951X 9-Bay NAS Enclosure from QNAP features a hybrid drive bay design with five 3.5" SATA III drive bays and four 2.5" SATA III drive bays. When 2.5" SSDs are installed in their dedicated bays, you can enable SSD caching and Qtier auto-tiering technologies to boost overall system performance. The TVS-951X is powered by a 1.8 GHz Intel Celeron 3865U Dual-Core processor and 2GB of dual-channel DDR4 RAM in a 1 x 2GB configuration. The memory can be upgraded to 32GB by using one 16GB module in each of the two SO-DIMM slots, and network connectivity is achieved using one 10 Gigabit Ethernet port and one Gigabit Ethernet port. When connected via the 10GbE port, data can be read at speeds up to 779 MB/s and written at speeds up to 739 MB/s. When transferring files with encryption, read speeds can reach 720 MB/s and write speeds max out at 363 MB/s. Use the three 5 Gb/s USB 3.0 Type-A ports to connect this QNAP NAS to other devices, allowing you to easily transfer large media files and expand NAS storage. Users can also take advantage of the HDMI 1.4b output to watch 4K media files on their HDTV, or stream to compatible devices using Plex. To aid in this, the TVS-951X supports hardware decoding and real-time transcoding, and resolutions are supported up to 4096 x 2304 at 24 Hz. Additionally, the this NAS is validated with AES-NI and FIPS 140-2 AES 256-bit encryption, helping to prevent sensitive business data from unauthorized access and breaches. QNAP has engineered the TVS-951X to support RAID 0, 1, 5, 6, 10, 50, and 60, each of which offers data redundancy, performance, or a combination of both. For those who do not require a RAID, JBOD and single disk modes are also available. Included is a a power cord, a 120W AC power adapter, two Ethernet cables, flat head screws for 2.5" drives, and flat head screws for 3.5" drives. Protection is provided by a limited 2-year warranty. SSD prices continue to fall, but creating a full-SSD storage solution is still out of reach for most users, especially if they require high-capacity storage. The TVS-951X provides the ability to use a hybrid storage structure that leverages the benefits of both hard drives and SSDs to provide high storage capacity and high performance. You can flexibly allocate applications to SSDs, set up a SSD cache, or use Qtier technology to automatically tier your frequently-accessed files to the SSD for the high access speeds. Users can take advantage of these features to fully optimize the storage utilization of the TVS-951X. Powered by a 7th-generation Kaby Lake, 14 nm 1.8 GHz Intel Celeron 3865U Dual-Core processor, with 2GB of DDR4 dual-channel memory (up to 32GB) and SATA III 6 Gb/s HDD and SSD drive bays, the TVS-951X delivers high-performance read/write speeds and maintains high speeds even with AES-NI encryption is enabled. The TVS-951X features a built-in 10GBASE-T network port to provide 10GbE high-speed network connectivity. You can use the TVS-951X with QNAP's 10GbE unmanaged switch (sold separately) to upgrade your network infrastructure to benefit from faster transfer speeds and to improve bandwidth-demanding applications. Both the TVS-951X and QNAP's 10GbE unmanaged switches support NBASE-T (10G/5G/2.5G/1G/100M) five-speed network technology, so you don't have to replace the existing Cat 5e, 6, and 6a cables in your current network infrastructure. Featuring integrated Intel HD Graphics 610, the TVS-951X supports dual-channel 4K H.264/H.265 hardware decoding and real-time transcoding, allowing you to convert videos to universal file formats that can be played on multiple devices. You can also watch high-quality 4K media files on a HDTV using the HDMI 1.4b output at resolutions up to 4096 x 2304 @ 24 Hz, or use it with Plex Media Server to stream media files to mobiles devices and media streaming devices, including DLNA, Roku, Apple TV, Amazon Fire TV, and Chromecast. The QNAP RM-IR004 remote control (sold separately) can be configured using QButton to customize the actions of individual buttons, providing a more convenient NAS experience. Please note that the TVS-951X's hardware provides H.264/H.265 hardware decoding, encoding, and transcoding capabilities. However, playback quality may vary due to factors including playback software, file formats, system usage, and available bandwidth. Roon, the music player for music lovers, identifies all the music stored on the NAS and consolidates them in Roon's interconnected digital library. You can browse and play music with Roon apps on compatible devices for a multi-zone multimedia experiences. The TVS-951X supports the Roon Server app in the QTS App Center and provides the performance, storage potential, and SSD caching to optimize music streaming. The app-driven QTS operating system provides solutions for simplifying file backup, management, search, and more. With File Station, you can view and manage the files on your TVS-951X and other storage sources/devices; the OCR Converter allows you to extract text from images; Qfiling helps automate file organization, and Qsirch helps quickly find files. Use File Station to directly access files on USB devices, including optical disc drives. Files from different devices can be easily viewed and managed on a single interface. Snapshots help protect your data by fully recording the NAS system state and metadata. If a file is accidentally deleted or modified, you can use snapshots from the Storage & Snapshots Manager or the File Station to quickly restore the file to its previously-recorded state. QNAP snapshots are block-based and only record the changed data. Not only does this save storage space but also reduces the time required to back up and restore data. The TVS-951X supports up to 256 snapshots per volume/LUN, and up to 1024 snapshots in total. The TVS-951X supports block-based iSCSI LUN that provides a more reliable and isolated environment compared to file-based LUN. Supporting VMware, Citrix, Microsoft Hyper-V, and Windows Server 2016, the TVS-951X provides a dependable and affordable storage solution for virtualization environments, while also supporting VMware VAAI and Microsoft ODX to increase performance by offloading server loading for ESXi server and Hyper-V respectively, and supporting QNAP vSphere Client plug-in and QNAP SMI-S provider with enhanced operational efficiency and management in virtualization applications. Virtualization Station allows you to run multiple Windows, Linux, UNIX, and Android virtual machines on the TVS-951X. You can use Virtual Network Computing (VNC) through a browser to operate the virtual machines. Virtualization Station is ideal for organizations to run multiple applications on a single NAS. Container Station integrates LXC and Docker lightweight virtualization technologies. You can download apps from the built-in Docker Hub to import/export container apps and manage access control, enjoying the benefit of easy installation, transferability, and high efficiency. QNAP's QVR Pro surveillance solution allows you to arrange a dedicated, independent storage space for surveillance data on TVS-951X and leverage the advantages of scalable storage. With QVR Pro, camera management, storage space allocation, camera live view, and playback is greatly simplified. You can also use USB webcams as network cameras with the QUSBCam2 app, and remotely monitor your surveillance feeds at any time with QVR Pro Client's companion mobile app. QVR Pro is compatible with over 5000 IP cameras and includes 8 free IP camera channels. Up to 128 camera channels are supported. The TVS-951X centrally stores data and files, and supports SMB/CIFS, AFP, and NFS protocols for file sharing across Windows, Mac, and Linux/UNIX devices. Coupled with Qsync (a utility that turns a QNAP NAS into a safe, high-capacity data center for file synchronization), files uploaded to the TVS-951X will be made available for linked devices, such as computers, laptops, and mobile devices. Hybrid Backup Sync can help you easily backup or synchronize data on the TVS-951X to other QNAP NAS, remote servers, or cloud storage for easy disaster recovery. Simplify file access, NAS management, multimedia experiences, surveillance, and download tasks with QNAP mobile apps. Designed for use in 1-8 bay NAS environments within home, SOHO, and SMB environments, the 8TB IronWolf 7200 rpm SATA III 3.5" Internal NAS HDD from Seagate is built to withstand 24x7 operations, or 8760 hours per year. This 8TB drive has been equipped with a SATA III 6 Gb/s interface, a rotational speed of 7200 rpm, a 3.5" form factor, and a 256MB cache, providing users with an ample storage capacity and data transfer speeds of up to 210 MB/s. This IronWolf hard drive also has an MTBF rating of 1 million hours, 600,000 load/unload cycles, 1 in 1015 non-recoverable read errors per bits read, and a workload rate of up to 180TB per year. Protection is provided by a limited 3-year warranty. Number of Bays 5 x 2.5"/3.5"
Box Dimensions (LxWxH) 15.0 x 13.5 x 10.0"
Box Dimensions (LxWxH) 7.8 x 6.0 x 2.3"